Is There a Return to Work Program Iowa Workers' Compensation? Is There a Return to Work Program for Iowa Injured Workers? ?How does workers' compensation and employer's liability work? In some states, employers purchase workers' compensation coverage through the state. Some states have extensive return to work programs which can provide vocational benefits to injured workers, but usually provide much less monetary compensation. In Iowa, we have a workers' compensation system that is run by a state agency, but insurance policies are purchased through individual insurance companies or some employers are self-insured. There are some state agencies like Iowa Vocational Rehabilitation Services that can provide assistance to injured workers and other Iowans who have lost their jobs. You can reach Iowa Vocational Rehabilitation Services at 515-281-4211. There are vocational counselors located throughout the state of Iowa and you would likely meet one of them in a town near you. Will the Insurance Company Help Me Get Vocational Assistance? Sometimes the insurance company will hire a vocational person to assist you with finding work if you are not able to return to your prior employment. Keep in mind that these people are paid by and work for the insurance company regardless of what they tell you. So be very careful when trying to deal with a vocational person hired by an insurance company or your employer. There are some good ones out there, but many are simply trying to reduce the amount of money you receive in your case by trying to show that you are employable and there are lots of jobs available to you. They may send you 5 to 15 job leads per week, but they have not actually contacted the potential employer, have not looked at a job description to see if it fits within your restrictions, etc. So be careful and keep in mind who they are really working for. How Does Vocational Rehabilitation Affect My Case? Under Iowa law, if you sustain a permanent work injury which prohibits you from returning to work and are in a recognized vocational rehabilitation program, then in addition to your other workers' compensation benefits, you can receive $100 per week for up to 26 weeks. I know this is not very much compensation for vocational benefits, but thankfully in Iowa our weekly wage benefits are much higher than in other states. For example, some states have caps on weekly benefits as low as $468 per week, regardless of whether you were making $1,500 per week. Generally, in Iowa the amount of your weekly check is based upon your average weekly earnings before you were injured, your marital status, and your number of dependents. There is a chart that changes every year that calculates 80% of your spendable earnings based upon the above factors. Often the amount of your weekly check is a little less than your normal take home pay but is generally not taxable. The weekly amount that you receive is called your rate and we have other articles that discuss your rate along with a book that we offer at no cost or risk that discusses rate, how much compensation you should receive for different types of injuries, how to avoid costly mistakes and much, much more. 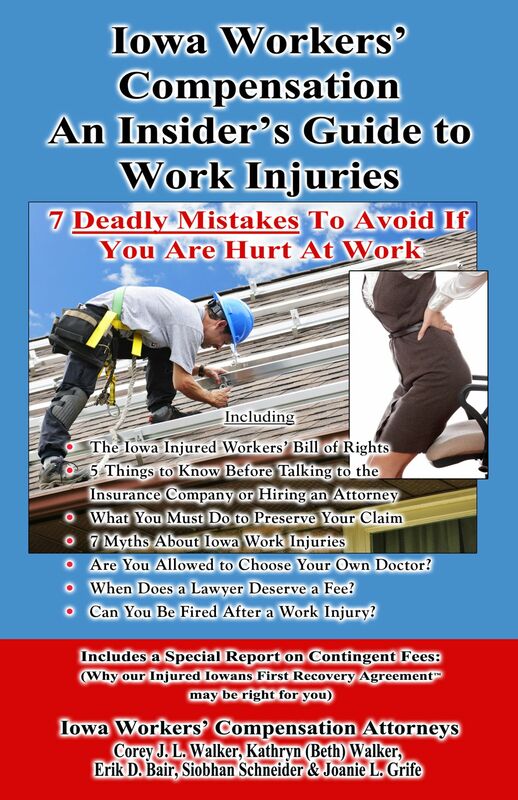 To learn more about Iowa's workers' compensation system, including the 7 Deadly Mistakes to Avoid if You are Hurt at Work, order a copy of our book “Iowa Workers’ Compensation - An Insider’s Guide to Work Injuries” by clicking on the image or calling 1-800-707-2552 (ext. 811) (24 Hour Recorded Message). Why offer a Book at No Cost? Iowa Workers' Compensation Attorney Corey J. L. Walker offers his book at no cost because he has represented hundreds of Iowans hurt at work and seen too many clients make mistakes before they knew about their rights and responsibilities, costing them thousands of dollars. Iowans injured on the job are beginning to realize that the workers' compensation insurance company is not there to help them and they should at least consider having someone on their side. Finally, you can learn about Iowa work injuries in the comfort of your own home with no cost, risk or obligation. For immediate assistance call 641-792-3595 and ask for Corey or Erik.